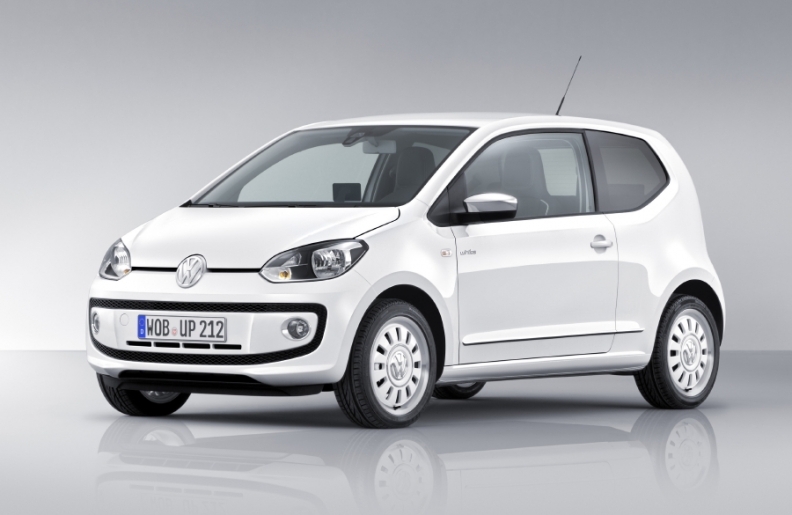 The VW Up will cost about 9,500 euros ($13,800) and compete with the segment-leading Fiat Panda as well as models from Toyota, Peugeot, Citroen and Renault in the product group least affected by the global economic slowdown. BERLIN -- Berlin florist Manfred Reich drove Volkswagen AG vehicles for a quarter century until a lack of a minicar in the lineup led him to Toyota Motor Corp. five years ago. Now, he's mulling a switch back to the German automaker when the Up minicar reaches dealerships later this year. "VW didn't have the right product at the time," said Reich, 58, who has owned his Toyota Aygo since 2006 and wants to sell it after "multiple" defects. "Now they do." Europe's biggest automaker is expanding the 62-model portfolio at the namesake brand division by adding its smallest and cheapest vehicle, seeking to tap growing demand for fuel-efficient small cars. The four-seat Up will cost about 9,500 euros ($13,800) and compete with the Aygo, the segment leading Fiat Panda as well as models from Peugeot, Citroen and Renault in the segment of the volume car market least affected by the global economic slowdown. The Up will be the first VW brand car built entirely from scratch to come to market under CEO Martin Winterkorn. The vehicle, due to go on sale in December, is strategically important for Winterkorn, who took over in January of 2007, as VW aims to claim the industry's top global sales position by 2018, leapfrogging Toyota and General Motors Co.
"VW is plugging a meaningful gap in its portfolio," said Henner Lehne, a Frankfurt-based analyst at research firm IHS Automotive. "You can't afford to be lacking a solid footing in the budget segment if you want to become the world leader." The Up may attract at least 100,000 new customers to the VW brand, marketing chief Luca de Meo said at a presentation of the car Tuesday at the automaker's Wolfsburg headquarters. The model, which will not be sold in the United States, is primarily for European customers, he said. "This is a small vehicle with huge potential," Winterkorn told reporters at the presentation. "The Up is another component of our growth strategy." IHS estimates deliveries of the Up, which is 3540mm (11.6 feet) long and 1640mm wide, may more than double to 279,717 in 2014 from 118,645 in 2012, its first full year on the market. Sales of the Aygo, which measures 3420mm long and 1620mm wide, may grow 26 percent to 89,095 over the next three years, IHS forecasts. Minicar sales are rising as buyers seek fuel-sipping models for driving in urban centers. Volkswagen has failed in the past to gain traction in this market, with the Up marking its third attempt to build a globally successful subcompact. VW halted production of the Lupo in 2005 after sales of the vehicle missed targets during its seven-year lifespan, while exports of the Fox, still built in Brazil, were squeezed by the appreciation of the real against the dollar. VW may replace the Fox with the Up, Ulrich Hackenberg, Volkswagen brand development chief, said at Tuesday's presentation. "We've long been lacking a presence in the small-car market," said Ernst-Robert Nouvertne, who runs two VW dealerships in Solingen, Germany, about 25 kilometers (15 miles) northeast of Cologne. "The Up will attract new customers to the VW brand." The three-door Up is based on a new underbody developed for a family of small cars that will include a roomier five-door version and a minivan, VW spokesman Markus Arand said. VW will run over 200 TV commercials and the same number of newspaper ads later this year to promote the model across Europe, de Meo said. Volkswagen's Czech division Skoda and Spanish unit Seat are sharing the Up architecture to develop vehicles to sell at less than 9,000 euros, said one person on condition he not be identified because the price and details of the models haven't been published yet. VW is building the Up in Bratislava, Slovakia, where lower wages help trim costs. Auto workers in the eastern European nation earned on average 8.08 euros per hour last year, the third-lowest in a ranking of 17 EU member states, according to the VDA German carmakers' lobby. German workers earned 43.76 euros per hour in 2010. Still, the Up's 9,500-euro price tag means it won't be the cheapest offering in the subcompact segment. The Picanto starts at 8,990 euros and GM's Chevrolet Spark begins at 9,140 euros. VW hopes the new model will help win over buyers like Simon Dobiasch, a 34-year-old online salesman at Deutsche Lufthansa AG in Frankfurt who was taken by the cheap price for minicars when he decided to buy his Aygo last year. The father of two now commutes to work from his home in Hanau in less than half the time required by train. "I'm gaining flexibility and time," Dobiasch said. "The car has been a valuable investment."